In their first three years or so as recording artists, the Rascals had achieved almost as much success as was humanly possible for any rock band not named the Beatles in the mid-to-late 1960s. There had been about a dozen hit singles, three of them #1 smashes. There were major television shows, tours across the US and Europe, and Top Ten albums. There was relentless musical originality and invention, which found them expanding from the blue-eyed soul base that had made "Good Lovin'" a 1966 #1 single to psychedelia that brought in horn and string arrangements, as well as lyrics that incorporated both spiritual growth and social commentary. 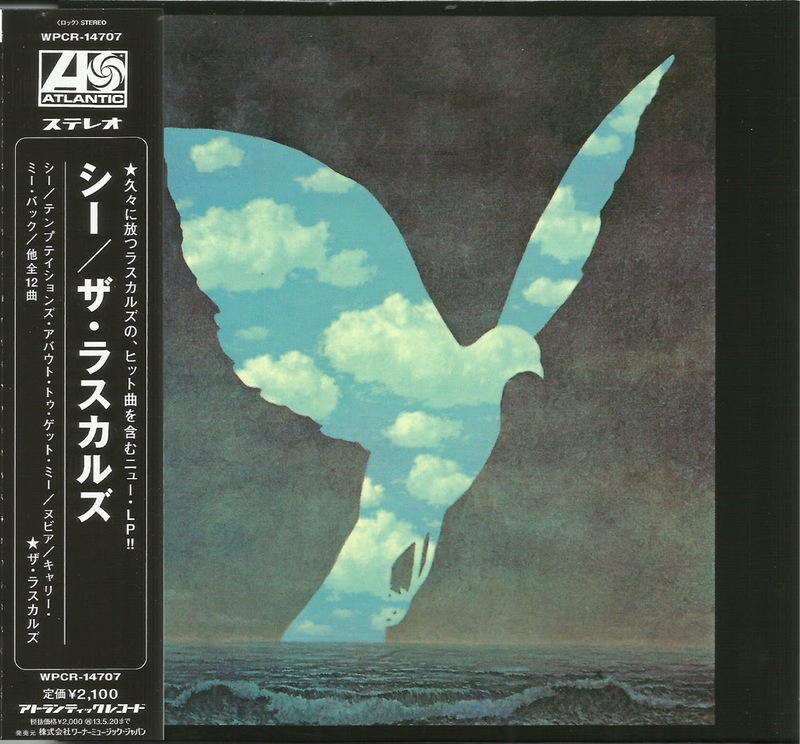 It all peaked with the liberation anthem "People Got to Be Free," which took over the #1 position for five weeks in the summer of 1968, and was part of their ambitious 1969 double album Freedom Suite (also issued on CD by Collectors' Choice Music). With so little left to prove, the Rascals turned increasing attention toward business and social agendas that were not strictly tied to songwriting and recordmaking. Even as far back as 1967, organist and singer Felix Cavaliere had told Melody Maker, "We'd really like to go on a world tour in Japan, Turkey, Europe and even the USSR to spread a message of peace. It would be a world peace tour. The message won't be simple pacifism, it'll go deeper than that. It's lack of communication that leads to ignorance and war. On our travels we have found already that young people are really groovy all over the world. Although we're not fighters or anything, we would like to do our bit to get them together." Though the Rascals didn't pull off such a global venture, they did something about as significant by announcing that their shows would feature half white acts, and half black acts—an important statement in a decade in which campaigning for civil rights was so vital, and all the more so coming from one of the few white acts with a sizable following among black audiences. "All our major concerts will be half black, half white, or we stay home," Cavaliere told Rolling Stone in 1969. "We can't control the audience, guaranteeing it will be integrated—and you better believe they're still segregated, if only by psychological forces that exist. But we can control the show. So from now on, half the performers will be black, half will be white. It was this way at the Martin Luther King Memorial we did recently at Madison Square Garden, and it was great." The group would also do benefits for UNICEF, Cesar Chavez, and the Long Island Tenant Farmers' Union. While the Rascals' stage presentations had became more musically ambitious as well—including a performance with the American Symphony Orchestra at the Garden State Arts Center in New Jersey—they'd also be more selective in those. "We're limiting our engagements starting the first of January," Cavaliere informed Rolling Stone, shortly after the group had canceled an appearance on The Ed Sullivan Show. "We got tired of seeing producers approach good groups and say, 'Give us a fast three minutes, then split.' We figured we were at the end of the road. Television has let the musician down. The last strike showed that. So we aren't going to them any more. There are things more important than money. We've turned down or canceled other shows, too." In the same Rolling Stone article, Cavaliere announced plans to start a label for ghetto youth, Ki Records, adding, "I was asked once on a black radio station what a young Harlem kid could do to make it. I couldn't answer that question. Now I'm going to try. There must be dozens of brilliant young musicians in Harlem, in Watts, but how do they get out? Who is going to give them a chance?" On top of all this, Cavaliere was studying Eastern mysticism with Swami Satchinanda, described in Billboard as "a non-profit prophet who is helping the singer-songwriter by tranquilizing his lyrics." Yet around the same time, the Rascals, or at least their management, were entertaining ever-widening commercial and business ambitions as well. In September 1968, Variety reported that manager Sid Bernstein had "agreements with two major filmeries for a picture in which the combo would act and perform pending his finding the right script. He has nixed three to date." Observed Bernstein in the same piece, "Sound of film can reach millions of people. If we did a soundtrack, we could double our annual gross, and if we appeared in the film, the figure would triple." Summarized Variety, "Bernstein is priming his act for everybody's ultimate goal, to be the 'American Beatles'...Bernstein feels that all that is preventing his act from reaching the summit of success is the attitude of the important 'underground' press who, according to Bernstein, regard 'the Rascals as teenyboppers.'" Of course, to be the American Beatles—or to carry off such ambitious business/social plans, as the Beatles were themselves trying to do with Apple at the same time—has to be funded by the capital generated by hit records. And sadly, in 1969, those were in shorter supply in the Rascals camp than big ideas. None of their three singles that year made the Top Twenty, though the final pair, "See" and "Carry Me Back," came close. Both were included on the album released at the end of the year, See, but that likewise was a disappointment, peaking at #45. Nor did it expand the group's musical vision as markedly as each of the band's albums had since their 1966 debut The Young Rascals, retreating from the sprawling experimentalism of Freedom Suite to songs of mostly fairly conventional length and structure. Guitarist Gene Cornish had told Melody Maker in the late 1960s that "it seems to be a new direction each time we do a record," but on See, it seems the band, like so many of their peers at the end of the 1960s, were embracing a simpler sound more in touch with their roots. It was also apparent that Eddie Brigati's role in the group was diminishing; though he'd written most of the band's material with Cavaliere at their peak, and taken almost as many lead vocals as Felix, on See he doesn't have any leads at all, and his songwriting contributions are limited to just one co-write ("I'm Blue") with Cavaliere. Viewed several decades later without the sky-high expectations listeners might have brought to a new Rascals LP in 1969, however, See reveals itself to have its share of solid tunes that play to the group's basic soul-rock strengths. "See" has a bubbling organ, pummeling rhythm, and train-whistle harmonies that would do the Five Americans proud; "I'm Blue" taps their skill at delivering a credibly Ray Charles-like number, something at which Cavaliere was especially adept at singing; "Carry Me Back" combined the gospel feel heard in several late-period Rascals singles with what was, for the group, an unusually country tinge; and "Real Thing" was a fine gospel-rock tune that perhaps would have made a better choice as a 45. And while the group had placed just one cover on their three previous albums, they dipped back into their most blue-eyed soul-soaked past with a cover of the Knight Brothers' 1965 hit ballad "Temptation's 'Bout to Get Me," with a dual Cavaliere/Brigati lead vocal. All songs are written by Felix Cavaliere unless as else indicated. 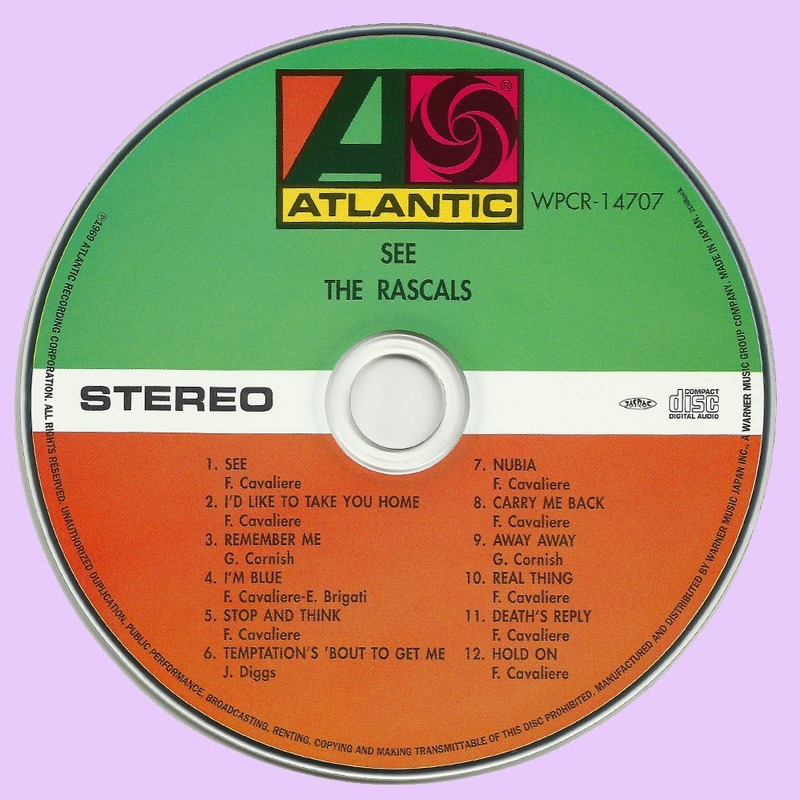 This is the only Rascals album I ever really liked from start to finish. My vinyl is no longer listenable so this will be a pleasure to hear. Many thanks. Thanks very much.. I have had a difficult time finding these later ones.. This, and Search and nearness (which I still havent found except in 128 kbps) proved impossible until now. I did find a cool , unplayed AMPEX tape copy of "Freedom Suite" which matters because the reissue doesn't include disc 2 at all! What an excellent blog! 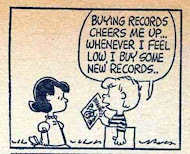 Many thanks for all the lossless files! Getting alot of these Rascals and Paul Revere and the Raiders ones! This stuff is highly appreciated!!! !